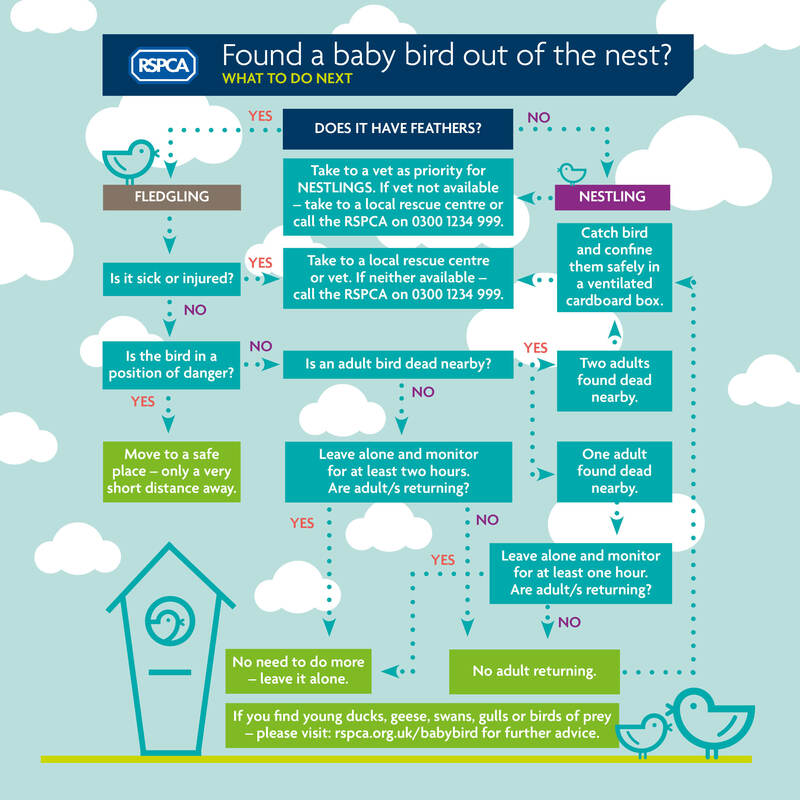 This usually depends on whether it's a fledgling or a nestling, we've created a visual guide for what to do if you've found a baby bird out of the nest. If a bird is injured, see what to do with an injured wild animal. Nestlings are baby birds that have no feathers, or only a few. Nestlings will not survive long outside the protection of the nest so take it to your nearest wildlife rehabilitator. Fledglings have all or most of their feathers and leave the nest just before they can fly. Leave a fledgling alone and watch from a distance, as the parents are usually nearby and will still be feeding the bird. Never try to return a bird to the nest as this may disturb the other young birds and may be illegal. If a fledgling is in immediate danger, place it in a sheltered spot a short distance away. Our wildlife centres care for over a thousand 'orphaned' fledglings each year, picked up by well-meaning people. Most of these birds are not orphans and would've been better off left in the wild. Tawny owlets can climb back up into the nest. If you find a tawny owlet under a possible nest site, monitor from a distance to see if the parents are nearby. If you hear them calling, leave the bird alone. If, after monitoring, you think a fledgling is genuinely orphaned, take it to your nearest wildlife rehabilitator. Please don't try to care for young birds yourself ¿ they need specialist care and facilities to survive. If it's safe to catch and handle the bird then, wearing suitable gloves, place it into a secure ventilated cardboard box, lined with towel or newspaper. Don't offer food or water as they require a specialised diet. Keep the bird somewhere warm and quiet and take it to your nearest wildlife rehabilitator as soon as possible. It's often faster to take an animal to a wildlife rehabilitator yourself, as our officers may be out of the area attending other calls. If you're unable to transport the baby bird, contact us. Find your nearest wild animal rehabilitator. Get close to the birds in your garden - and help them out at the same time! Embed baby birds out of the nest on your site!